Do you remember Chris and Zak, they are the couple from Colorado who are planning a cycling trip to the 2012 Tour de France (Two Americans go to the Tour de France). We meet up with Chris and Zak again as they begin planning their trip to France, taking it step by step to build their dream trip. The first steps in any travel adventure is to look at a map, decide what you want to see within your route, ask a lot of questions, and begin to make some initial plans. To learn the route of the 2012 Tour de France, Chris and Zak go straight to the source - the official Tour de France website (www.letour.com). The route for 2012 was announced in mid October. Pedal Dancer Tip: I would recommend planning to see a variety of stage experiences: start, finish, mountain pass, mountain top finish, time trial, feed zone. Each experience is unique. I especially like stage starts because there is hours of fun, the same is true for time trials. Feed zones are actually quite fun and you can gather bottles and chat with team staff waiting to hand up feed bags. When seeing a stage finish, select a town which is fun to visit before and after the fast finish, where you can enjoy a meal or spend some tourist time. Mountain top finishes are thrilling all-day events for fans, they can involve up to 11 hour days for cyclists riding 60-100km to and from the Col, definitely plan a rest day the day after. 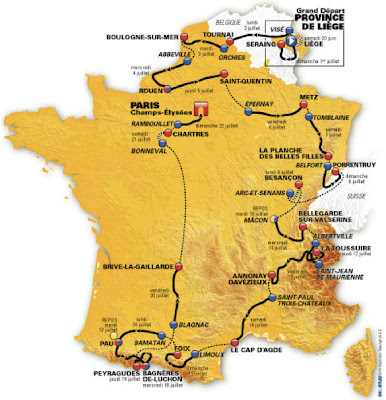 Pedal Dancer Tip: Within a 2 week trip to the Tour de France, you will be more than happy if you see 4-8 stages of the Tour de France. Even the best Cycling Tour Companies select the best stages for their guests and do not chase the Tour every day. 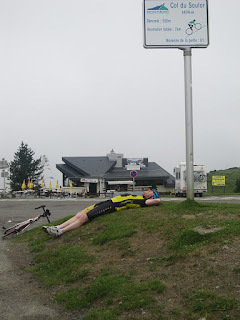 In 2003 I cycled 16 days over parts of the Tour, it was a bit much. This year the Tour de France travels along the Rhone River Valley - I say it is time to take in some vineyards! Pedal Dancer Tip: Once you consider the stages and your travel dates, a picture should emerge indicating where you should fly in and out of France, you are not limited to Paris. I much prefer flying in and out of the smaller airports in France. Also consider using the TGV (high speed trains) to transfer between larger cities. At this point your focus should be deciding what you want to do, making it happen will be covered in future steps. To learn the climbs of the Tour de France Chris and Zak visit Climb by Bike - a fantastic resource for climb descriptions and profiles of all the climbs in France. 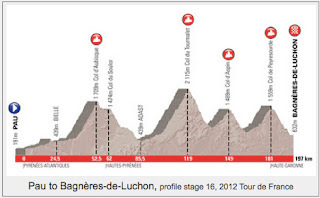 Climb by Bike happens to have a summary page for all the climbs in the 2012 Tour de France. For an excellent climbing resource for climbs in the French Alps visit Grenoble Cycling Pages. For an excellent map of most of the major climbs in the Midi-Pyrenees view VeloPeloton map of Cols in the Pyrenees. Look for future reviews due to come in the next 4 months by CyclingNews, VeloNews, Cycle Sport and other publications. Pedal Dancer Tip: There are certain climbs that all of us have heard about in conjunction with the Tour de France, maybe you have a few on your bucket list. If you can say "oh I've always wanted to do that climb," and it is not in the Tour de France this year, leave a day to make sure you get to achieve your dream, the climb may be in the Tour next year and you will be able to recall I was there! I think it is more important to make these side trips than trying to see every stage of the Tour de France. Every one of these climbs is worth climbing! 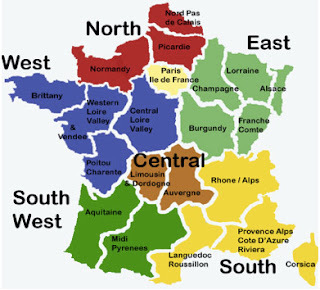 Pedal Dancer Tip: I buy one large map of France for planning only. I highlight each stage start and finish. 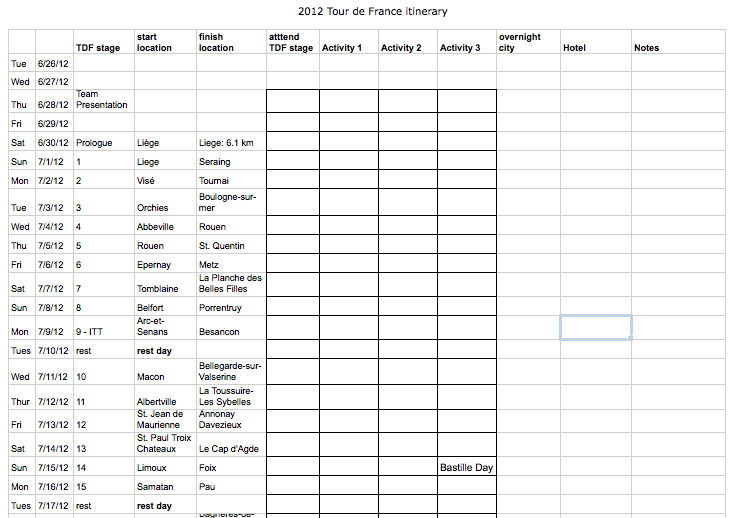 On this large map I begin to mark TdF stages and other rides I would like to complete while in France. I can then see optimal cities to search for accommodations near or in between the stages. Pedal Dancer Tip: I buy a spiral bound France Atlas and cut out the pages where I will be cycling, leaving the large book at home. I carry these pages with me in my jersey pocket while riding, just in case my GPS device does not locate my position while in the mountains, the altas page will show every intersection, even for small roads. 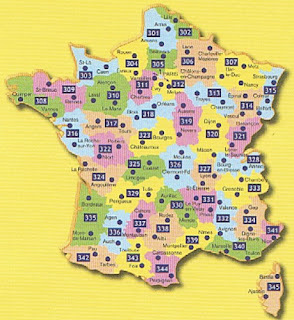 Pedal Dancer Tip: I do use my iphone apps like crazy in France, to locate wi-fi, GPS, etc, only watch the data charges! Pedal Dancer Tip: I still like real maps to see large scale - I decide which Local (yellow) Michelin maps to buy based on the stages I will be attending and where I need to see the roads in great detail. I don't ride with these maps, I use them for planning, but I do bring them to France with me. GPS systems: Pedal Dancer Tip: Yes the extra cost for a GPS navigation system in your rental car is worth every penny. 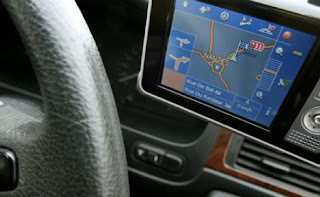 If you have a co-pilot you can use a Garmin, iphone, or any GPS hand held unit, but if you are alone, or with a map-challenged friend, use a car GPS system, they are invaluable. I really like that they warn me before I approach an automatic speed ticket camera. I also like that I can program them to speak to me in English (with an Aussie or Irish accent) or in French so I can space-out and enjoy the countryside until the next direction is audibly given. Hand-held or bike mounted GPS systems are excellent while cycling. Guidebooks also offer helpful information: Michelin Green Guides to France Pedal Dancer Tip: they are heavy, so cut out the pages you need rather than bringing the entire book. You can now buy some guidebooks for your iPad or as an app for your phone. Pedal Dancer Tip: When in France - keep it simple. Our motto is three things a day. That might include a stage start, drive to a new city to check into your hotel, plus a dinner out in town. Or an early morning market, ride, picnic. Whatever you do in your day, try to limit it to 3 major activities per day, you will experience the real France in the spaces in between. Pedal Dancer Tip: I also schedule an open/rest day about every 4 days. This allows for weather (that may keep you off a much desired climb), enjoying local culture, and true rest after several long days riding and chasing the Tour de France. Pedal Dancer Tip: build this plan so that it basically becomes your itinerary, one that you can leave at home for family to follow your adventure and use for contact if need be. Pedal Dancer Tip: Be clear and realistic about your expectations. With their new maps laid out in front of them, Chris and Zak discuss their top wishes they would like to do while in France. 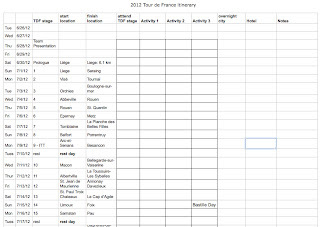 They begin by writing these down onto their plan, plotting them into the time schedule of the Tour de France. If they each achieve their top three wishes, their trip is a success, anything else is icing on the cake. Of course the unexpected, always makes for the best memories anyway. You do not need to plan everything. Next Chris and Zak sought out resources, people they could ask for advice. I was one of them. Tom and Courtenay from Colorado were another resource, so was Mike from Arizona, and Sue and Scott from Colorado - all cyclists who had traveled to France in previous years. Reading blogs from other travelers is also a helpful resource, or PezCycling travel articles. Also visit Mr. Patterson Goes to Languedoc written by an avid cyclist who lives and rides in France. 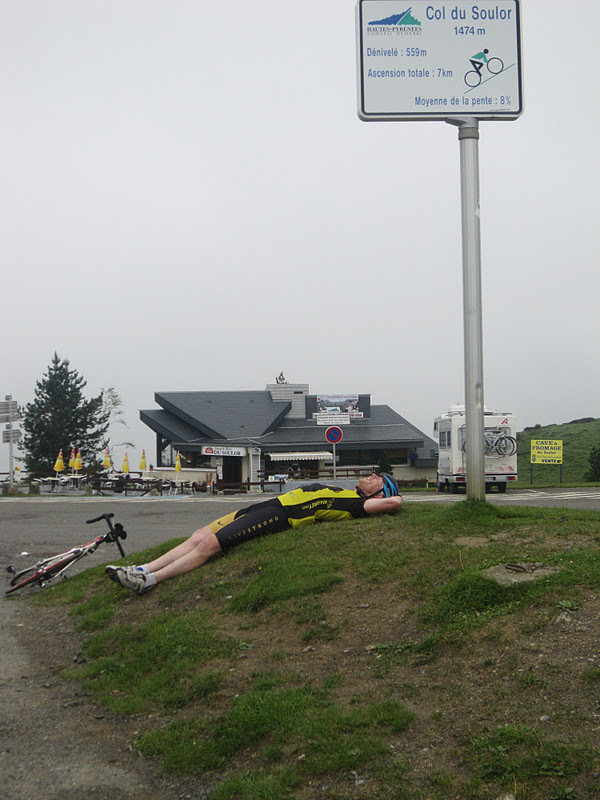 Read Paddy's VeloPeloton Blog all year long, he writes and photographs about his life living in the foothills of the Pyrenees. Pedal Dancer Tip: I like to read and learn from the itineraries and tips on the Cycling Tour Company websites. They bring clients to the Tour de France year after year and really understand the flow of how much can be covered within a typical 9-17 day vacation. Read more about traveling in France on the Pedal Dancer France Cycling Page. The Tour de France is Fun! Planning is a framework, a probability, not an expectation of exactness. Every person has at least one off-day while traveling, every trip has a number of unexpected occurrences, allow for this. These sometimes make the best stories and memories. I also admit that people are usually far more interested when I am going somewhere then when I have been somewhere. Anyone who loves travels, such as myself, knows that the planning, anticipation, and excitement is as fulfilling as the actual trip. Enjoy the planning! Arranging Accommodations in France for the Tour de France. Renting and driving a rental car in France. Estimating your travel costs to France. Packing for a cycling trip to Europe. Training for the Tour de France. Food and restaurants in France. Tips on traveling around France. Tips on being at the Tour de France. Understanding the race that is the Tour de France. Leaving home in not too much of a panic. And any other topics that happen to arise during their adventure.